I really wanted to like this movie, but it was so incredibly slow. It was 2 hours and 20 minutes of overly zoomed in shots and extreme shakey camera work. Also some scenes were completely silent for minutes on end. I wish I could have fast-forwarded through so many scenes that dragged on. Also there is no sound is space, which they failed to get right. Honestly, a movie worth your money is a Star is Born. Bradly Cooper directs, acts, and sings live in it. I was a child when the circumstances surrounding this movie took place. I was very interested in the details of the beginning of our space program, and I wasn’t disappointed. The movie was a bit slow, but I appreciated the in-depth telling that explained what happened and what NASA and our astronauts went through in the infancy of space exploration. The movie captured my attention from the beginning until the end. Well done. Was captivated from start to end. It brought to our attention the constant stress those families were going through.. I think it would be hard for the new generation to appreciate it to the fullness. Made you understand how difficult the space race was & the toll it took on everyone involved. Well done! Such a good story but this movie butchered it. Slow, drags, depressing. The filming was too close to everyone, the mood down throughout, didn't touch my emotions at all - it certainly should have. Very disappointed, I only gave it a 2 because of the true story it was based on. This movie is about how we look at and accept death. We are seeing this against the backdrop of Neil Armstrong's career and personal life. 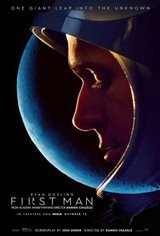 There's lots to see here including the race to the moon and also, it shows how everyone involved in making this movie is supporting the delivery of the concept of our humanness through Ryan Gosling's portrayal of a man in crisis. When I went the audience applauded at the end. Go see this one and I think there's more movies like this one coming. We are human and we need to be conscious of that. This movie was so good I saw it twice, which is something I rarely do. I thought the movie was great; the movie showed the race for space as it really happened. Well done and touching insight into what it takes to be an astronaut. Brought back memories of that era. Slow but very compelling. I was remembering my life as a child when first men were flying into space. There were so many sacrifices and losses of life to achieve amazing progress in a short time span, many undisclosed to the public. We only knew when somebody big like Gagarin died - he got killed during a test flight. The film shows how hard the work of early astronauts was - unending political pressure, constant physical exertion to the breaking point, every flight was in untested equipment and unpredictable circumstances, getting used to friends dying as part of it. Early Russian cosmonauts did not have families until they got out of the space program, that's how much concentration was required of them. It is the easiest thing in the world to look at space exploration as an exciting adventure, it is impossible to imagine how lonely and scary the first space travel was. The film is about a very strong man and all the strong men who paved the way, sacrificing everything they had no matter how painful and getting us there. And here's the newsflash - they were just pilots and technicians, not entertainers. They did not need to be, being good at their job and getting the human race there while enduring so many hardships, is more than enough for us to always remain emotionally and spiritually engaged with the space quest. Disappointing, boring. Not very fact based. I wanted to love it, but it was boring. Excellent film if you digest what the director was getting at. It is difficult to imagine what an extraordinary life feels like. You can almost get the feeling through this movie how Armstrong knows he's involved in something much bigger than himself. People who say this movie lacked emotion are clueless. We must accept those who were involved in the space program of the 1960s weren't doing this for fun and giggles. They expressed themselves the best they could in the face of overwhelming odds while venturing daily into continuous unknowns. This movie reflects the humbling perseverence of a tempered human spirit. Very poorly done, devoid of emotion and meaningful conversation. I was so disappointed in this film. I loved the space program and was one of the early risers to watch this historic event when it happened back in 1969. This movie really missed the mark for me. Well acted, visually stunning film. This was a faithful recounting of the life of Neil Armstrong, the man. The movie was about him, which, in part, included his professional life in astronautics. Those who knew Neil, had much input into this movie's turn out. Those who went to the movie to see a story about the space program and the first moon landing, might be disappointed. That was not its intention. Astronauts have feelings, this was about the man and his feelings not about the Space Program, per se, though there are some stunning scenes in that area. Neil's life revolved around his children - moreso, even, than his wife - and she knew it. That's what the movie is about, in particular, the loss of his 4 year old daughter, Karen. People, generally, thought they had a good idea about what was going through Neil's mind as he stepped into the lunar surface. As usual, public opinion being the worst possible source of information there is - they had no clue. Armstrong's thoughts were of his daughter - even as he touched his boot on the lunar soil. Being a father of two such losses, I empathized very well here. Neil Armstrong was a tortured soul, that, known only to his brothers, and his wife. could have been better, The movie was acted out as fact but it is mostly fiction. Neil Armstrong was a rather private person who became very public, but never pushed that after that last, greatest mission which made him a historic figure. This film depicts very well how that happened and how that felt. Aside from that lunar landing, he had at least three other close calls . He had books written about him and the event, but did not write one himself. Aldrin and Collins did, and I recommend "Return to Earth" and "Carrying the Fire" for more information. This movie, I suspect, speaks well for Armstrong; the harrowing nature of the work, the tension of waiting (especially in the shadow of disasters which did happen), the feeling of floating in those tin cans (to paraphrase David Bowie), etc. I found this film to be a gripping experience. It brought back a lot of memories and is of a piece with all the best films on and around the history of space travel. It's not perfect. My biggest criticism is the use of handheld camera for too many of the scenes on Earth. But the recreations of the scenes in flight and on the Moon ... oh my! By the way, ... they did it. Six successful, one successful failure (Apollo 13). If they'd faked, the Soviet Union would have known and exposed them. Just one more thing: I'd forgotten Gene Cernan had accompanied Neil Armstrong on Gemini 8. Cernan was the "last man" to this time. Very good movie about Neil Armstrong's life during the 'Race to the Moon' years. This movie has a unique style somewhat similar to 2001 A Space Odyssey, very visual and introspective. If you're not an aviation/space fan this movie may not suit you. Really bad in almost every way. This apex of human achievement deserved so much more. So much less than "All the Right Stuff". Drags, all about Neil Armstrong being stoic and petulant. Boring movie about one of the most exciting times in American history. Un-American to not show putting up the American flag on the moon. Claire Foy is anti-American. made me feel how the first man on the moon felt,also all its dangers. also being it is historial. I really enjoyed this movie and will definitely watch it again. I liked this movie tremendously and wasn't the least bit bored. Good basis for a good movie, but this one was poorly done.